Because there simply isn’t enough to keep me busy in Legion (har har), I often spend spare time collecting transmog items — the more Druidly, the better. In fact, six of my favorite words are You have not collected this appearance. When I first started “shopping”, I didn’t really make a plan, assuming that anything I managed to acquire was going to be great, but I eventually found myself running the same dungeons over and over, mostly because they were easily accessible. Even when I began to specifically target set pieces, I had a fundamental misunderstanding of how setting raid difficulty worked. As it turns out, setting your Burning Crusade raid’s difficulty to Mythic doesn’t actually set it to the highest available level of difficulty! For the longest time, I had a certain sentimental item languishing in my bank. I had repeatedly tried and failed to find items that coordinated with it when I happened to stumble upon a post by FlashYou: Looking for Transmog? (Leather Edition) which renewed my interest in turning the robe into an outfit. I happened to already have the Cataclysmic Gladiator’s Wyrmhide Helm mentioned, but I am not a fan of over-sized shoulders so opted instead to pursue the Malleable Steelweave Mantle which drops from the Cache of Innovation in Ulduar. I don’t like huge gloves, so I sought out the Cenarion Gloves from Shazzrah in Molten Core. There wasn’t an option to hide your belt at the time, so I went after the Flamewrought Cinch which also drops in Ulduar and is an exact texture-match to the robe. Editable PDF to track progress acquiring specific Transmog items. In the course of picking out which items to target, I naturally happened upon a number of additional items I wanted to collect. My hastily-scribbled notes on what, who, and where began to wear on my organizational sensibilities, so I decided to create an editable PDF to help keep me keep track of what I needed: a Shopping List that tracks the item’s slot, where it drops and from whom, as well as any difficulty or raid-size modifiers. One my favorite things about using this template is that, by storing it in my cloud drive, it’s something I can still access and add to when I’m away from my home PC. If you are interested, you can download a copy of this editable template at right. Note that the slot-indicator group is set up as checkboxes rather than radio buttons, so the PDF will not enforce mutual exclusivity. A radio group would have made more sense, but I couldn’t figure out how to replicate radio groups across multiple rows. I recommend choosing one high-impact piece — head, shoulders, chest, or staff — and building on that. WoWHead has a great transmogrification browser that allows you to specify the gender and race of the model upon which the items should be rendered (direct link to Druid transmogs). Icy Veins also has a nice resource for browsing transmogrification gear, either by slot or tier-set (the latter of which is sadly based upon the human male model, even for Druids). Finally, the site WoW Roleplay Gear has a compilation of mixed-and-matched “inspirational roleplay and tramsogrification outfits” that are not necessarily limited to just the tier-sets. Of course, no discussion of a feature as rich as transmog would be complete without discussion of at least one add-on! A friend recently introduced me to mOanArs WardrobeHelper, an add-on which lists instances grouped by expansion with separate categories for groups and raids (as an aside, Cataclysm had the ugliest item models). For each instance, it lists all items available to your current character that have not yet been acquired, grouped by boss. For instance, if I decided I wanted to run Wrath of the Lich King raids one evening, it’s easy to switch between the Naxxramas listing of items and the Icecrown Citadel listing to decide which bosses to prioritize. There’s even a dropdown for switching between the various levels of difficulty. Transmogrification was first introduced in patch 4.3.0 and initially required players to permanently store any items with which they intended to transmogrify their gear. Since the pre-release Legion patch, however, we’re no longer limited by how many items we can fit in our banks and void storage, a change that made collecting transmog gear a much more enjoyable auxiliary path of progression. Is this something you personally enjoy? If so, do you have any favorite add-ons or resources for planning your shopping trips? You look fantastic! I prefer the “mix and match” looks for some reason, I think it boosts the creative side. So … are you rich now? I generally agree about mixing and matching, but usually because there is often an option than coordinates better than what is provided as part of the set. Malfurion’s Battlegear is a great example. It includes my very favorite robe and one of my favorite headpieces but those SHOULDERS. Ugh. So many better options! Running old raids is fairly lucrative and selling all of those Raiding with Leashes pets! 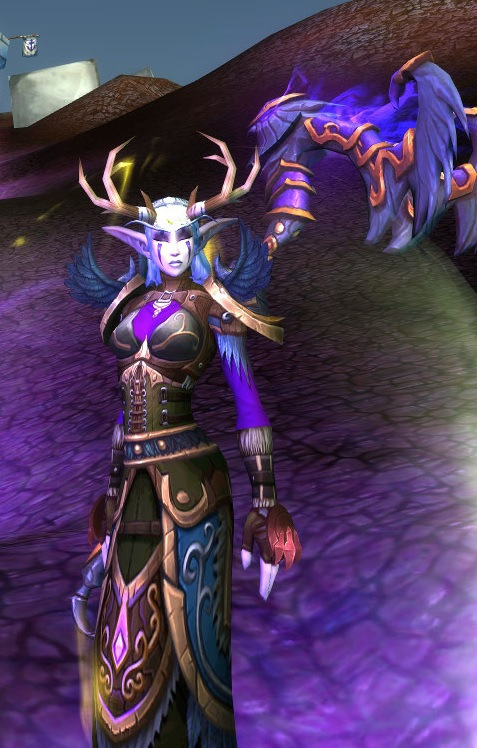 I adore Malfurion’s Battlegears robe too! I´ve always been a fan of those chest pieces that comes with a collar. I have not been transmog hunting alot yet, so much to do! But I like the change to tokens they made in 7.2, so you do not have to visit a vendor. Although its very nostalgic visiting The Battle for Mount Hyjal after running Black Temple..! If and when I finally commission a portrait of my character, this is the outfit I will probably request! Will try to post more transmogs at some point (graphics editing is actually pretty hard on my hands, as you might imagine). I adore that staff too. Although a part of me feels is so wrong to transmog over G´Hanir!